The Honeywell Voyager has reached end of life. It has been replaced by the Honeywell Voyager 1200g. With a history of high performance, the Metrologic Voyager scanner is the top barcode scanner in its class. Perfect for point of sale and health care applications, the stand allows for easy hands-free operation. 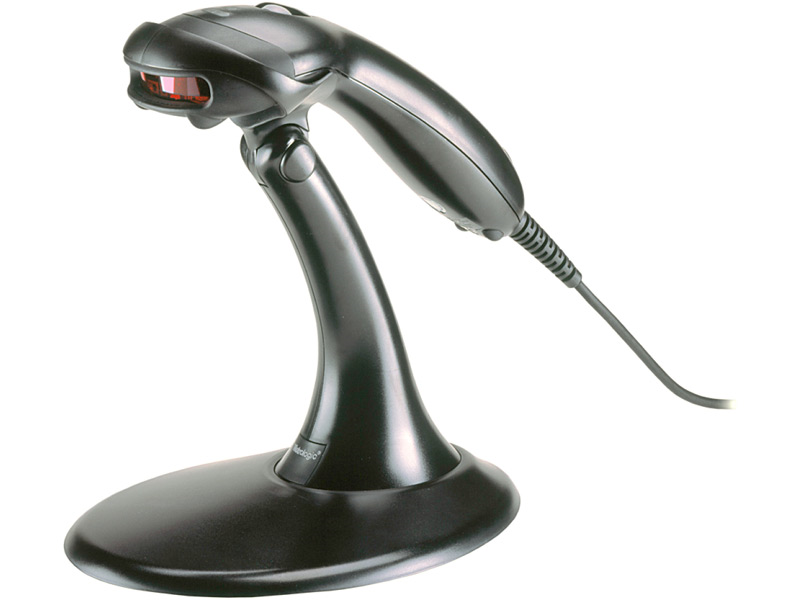 All Voyager barcode scanners include stand, cable and manual. The feature-packed MS9520 is a triggerless, auto-sensing barcode scanner, automatically detecting the barcode within range. If manual trigger functionality is preferred, select the MS9540 with Metrologic’s patented CodeGate technology. CodeGate allows the user to activate a button that keeps the beam in use, allowing continuous scanning. The MS9540's trigger mode puts control back in the hands of the user, activating the laser beam only when the trigger is pushed. Any additional questions about Metrologic scanners? 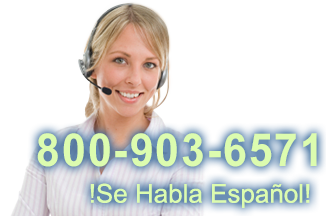 Call a POSGuys.com sales representative today! Feb 2016 - The original Voyager is one of the all time best selling scanners. 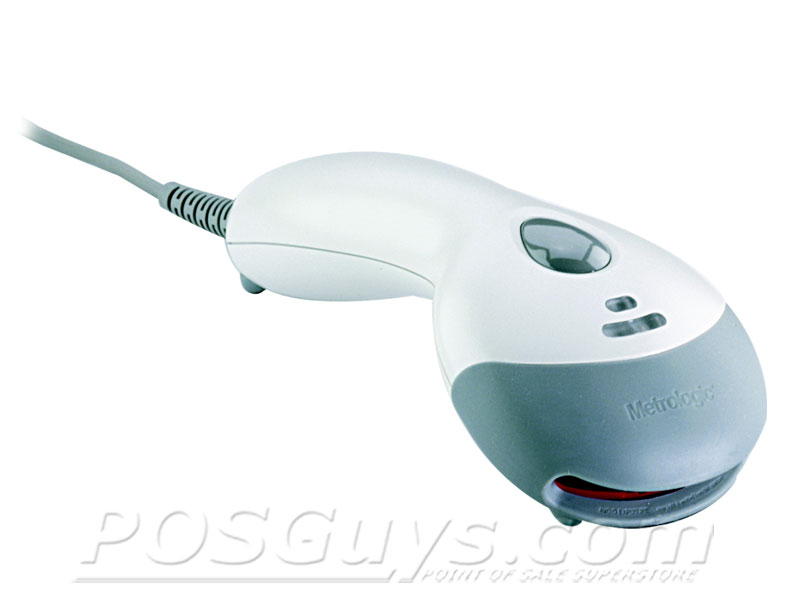 Used in a variety of retail applications it was very popular with cellular stores and retail stores. Since then Honeywell has released the Voyager 1200g which is also a laser scanner but scans better and is more durable along with the Voyager 1400g which has omni directional scanning capabilities in a similar form factor. Previously (2016): 4/5 Stars - "The Metrologic Voyager is a solid scanner that will provide your retail location with years of dutiful hands-free service." Find it faster! Click here to compare Voyager models by feature. SVC9520/40-SMS5 MS9520/MS9540 Voyager - 5-Year Warranty, 1-day turnaround, comprehensive coverage. Hi this is Jamie with POSGuys.com reviewing the Metrologic Voyager. 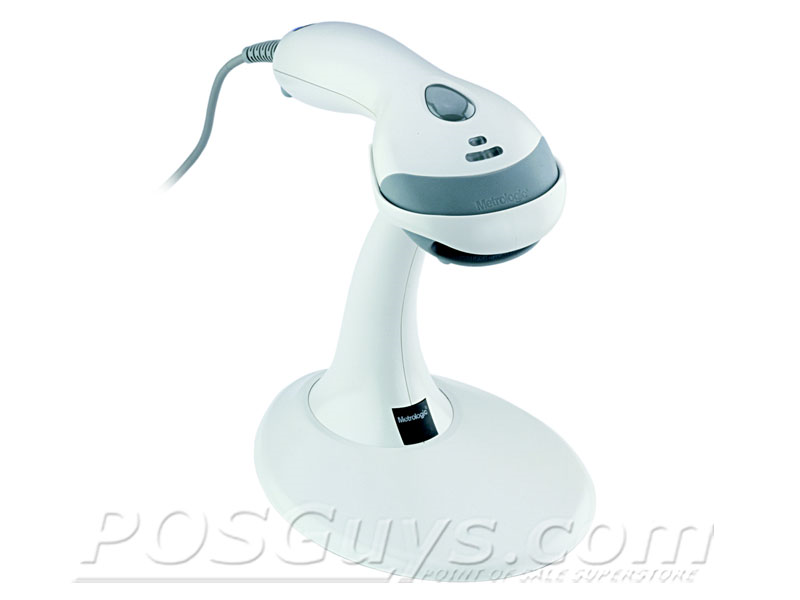 The Metrologic Voyager is mainly used for medium volume retail environments, it has a pretty good range it goes from contact scanning to about 12 inches away. It does fairly well with damage or faded barcodes. One downfall to this Metrologic Voyager is that it doesn't scan very well in outdoors light. This is the Voyager Bluetooth. It is the wireless version. It has very good scanning range. It is mainly used in retail environments. It comes with code gate technology and you can wall mount it if you want and it sits, like a phone. This is the Voyager PDF it is the more advanced version of the Voyager because it has CodeGate technology and PDF scanning capabilities. When it is in the stand it is just autosensing and when you take it off the stand that is when the CodeGate is enabled and so you find the barcode and once you find the right one you push the button. So if you have a package or something with a bunch of barcodes this helps you be more accurate so you don't scan the wrong one. For people who want to scan PDF barcodes such as on the backs of drivers license or packages this is how you would scan it. Go slowly over it so you get all the information. 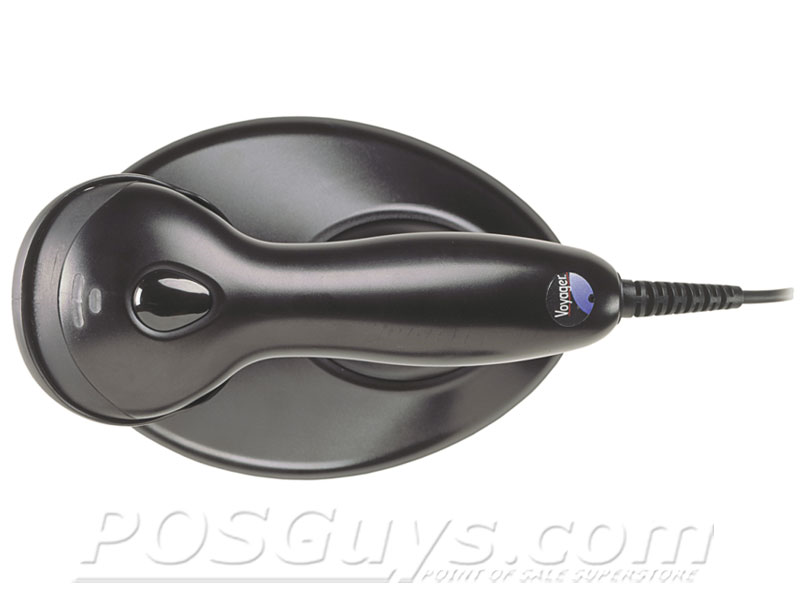 For people that primarily use a scanner and a stand this is one of our best selling scanners. For a higher end scanner that scans PDF and with CodeGate technology you have the Voyager PDF and if you want more mobility you have the Voyager BlueTooth. 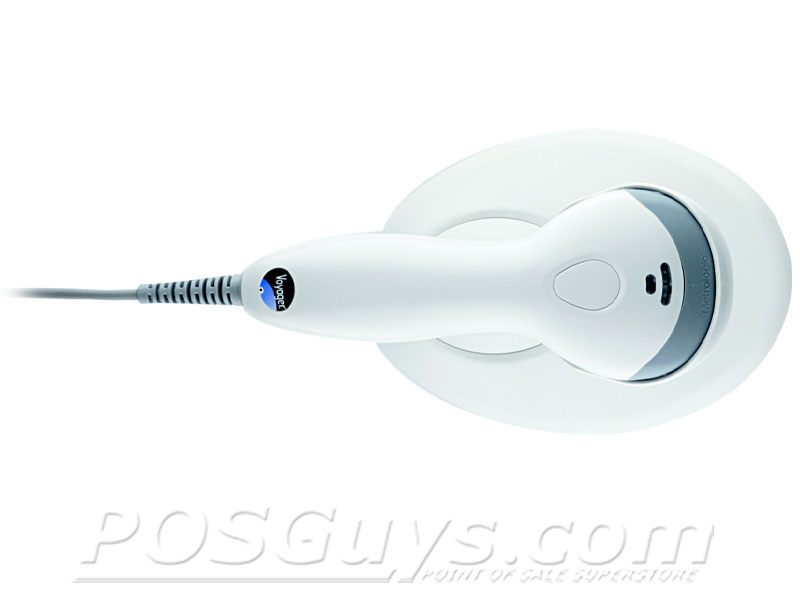 So for more information on Metrologic products you can visit us at www.POSGuys.com.